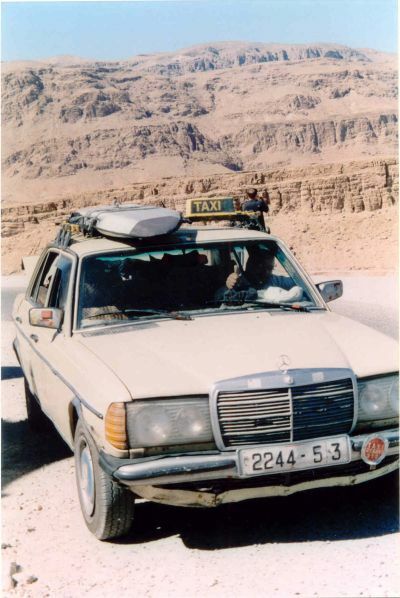 the bus service throughout morocco was unreliable, so we hired a grand taxi to haul us around. from fes we rode to the sahara desert in merzouga, morocco. jamie's surfboard is strapped to the top and my bicycle is stuffed in the back of the old mercedes taxi as we stop to take some photos on the road. 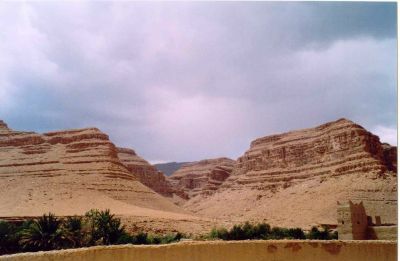 morocco is known for it's amazing scenery. the groups of palm trees and red buildings running through the valley of a sandstone canyon is what impressed me the most - the contrast of green and red was stunning. 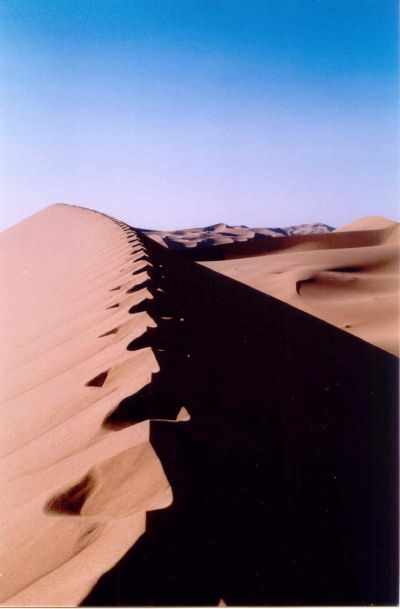 merzouga, morocco is at the western edge of the sahara desert of northern africa. we stayed in a kasbah at the base of the erg chebbi, a massive sand dune where the movie "the mummy" was filmed. 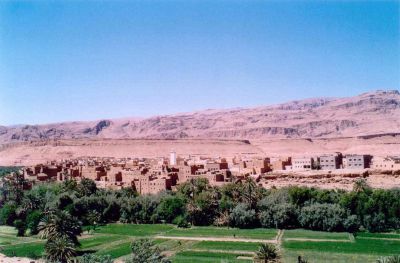 the indigenous people of northern africa are berbers, a nomadic culture whose people historically lived in tents and rode camels. some have moved into kasbahs and ride motorcycles though as this picture shows. 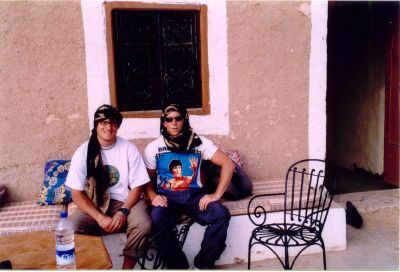 jamie and i hanging outside the kasbah waiting to ride camels into the sahara desert for a couple days. some guy wrapped our heads in turbans but then wanted money for them. we didn't buy the turbans but at least we got a picture of us wearing them. the classic desert shot. jamie, our friend alf from norway, and i are led into the desert by a walking berber. 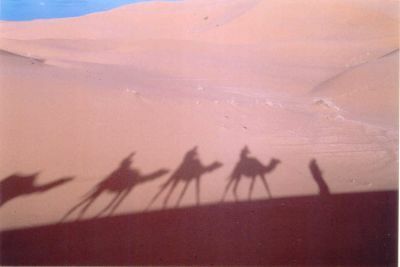 the 4th camel, the one on the left, carried blankets and food. that's me on the camel in front of it. after several days, we left the desert for marrakech. 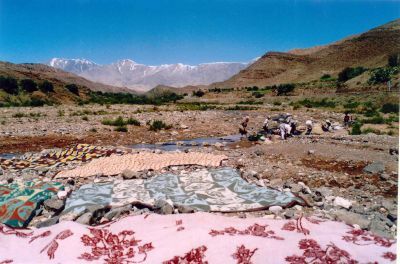 along the way, we had our grand taxi pull over so we could take pictures of the women washing carpets in the river. the atlas mountains rise in the background - they stood between us and marrakech. 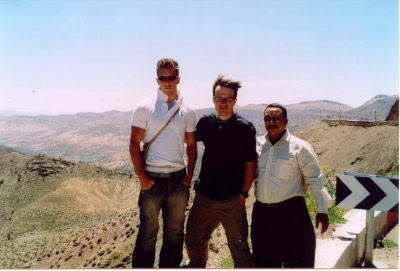 jamie, me, and our driver, abdul azziz, posing at the top of the atlas mountains. abdul spoke about 4 words of english so we had to speak to him in french, which i don't speak much better than arabic. we arrived in marrakech and booked a place right next to djemma el fna, probably the most famous place in morocco. 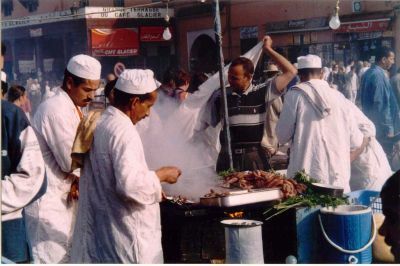 it is the site of snake-charmers, street-performers, and, best of all, food-stands with chefs hawking their inexpensive culinary creations at dozens and dozens of outdoor tables. 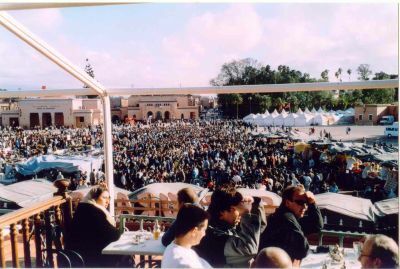 the view of djemma el fna from a second-story restaurant. this is the site of the "i should have boxed" random thought. the place really came alive at night. the street performances were more exciting and the foods stalls were packed. the smoke from the grills continually poured over the square. 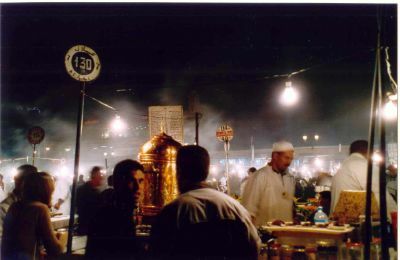 if you go to morocco, marrakech and djemma el fna are a must-see.